The 2017 People's Choice Award winner for Favorite YouTube Star is Lilly Singh AKA IISuperwomanII. In a humorous yet insightful book, she gives the definitive guide to being a bawse: a person who exudes confidence, hustles relentlessly and smiles genuinely because he or she has fought through it all and made it out the other side. 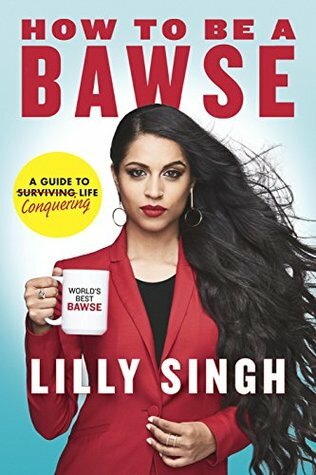 According to Lilly, there are fifty (50) rules to conquering your life; How to Be a Bawse (officially in my Top Books of 2017) details them all in an easy to read guide. I don't know how to properly review this nonfiction book without stanning out with tons of praise. Lilly Singh is my new BFF-in-my-head. She truly thinks and mentors like a bawse through clear explanations with supporting scenarios. I have so many screenshots and highlights in my eBook edition. Bookhearts know I do not make a habit of re-reading books but this one right here is definitely worth revisiting so I can track my progress, recap bawse tips and LOL while doing it. How To Be a Bawse is a must-have product for your personal library and mindset. I picked up many lessons that are sure to keep me on track with goals. I dare not group this book into a basic genre like self-help or memoir; it is so much more. If you are a goal digging hustler like myself and need guidance, this book is for you! Read it. Learn from it. Apply it. I'll say it plainly for slackers in the back. 🗣 I RECOMMEND HOW TO BE A BAWSE! Now excuse me while I go change all my passwords to an affirmation like StayDetermined! to give my brain a subliminal message.